My '20s evening frock--not the best silhouette on a curvy figure, but oh so fun. I made this costume on the fly for a friend’s ’20s-themed birthday party—and I have to say, it turned out pretty well, considering the tunic-style outer dress started life as a shawl purchased from TJ Maxx! I’d been researching ’20s-style evening gowns for several weeks, wondering how I could whip one up in a short amount of time but still have it be something I’d love. 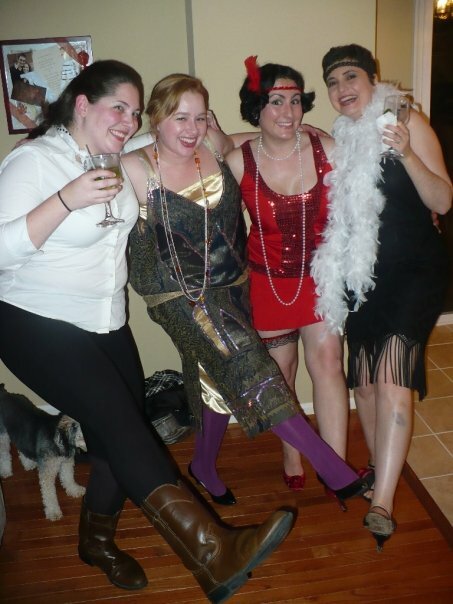 Flapper styles aren’t exactly ideal for my figure, but I love to get into the spirit of costume parties and themes. And I do love how opulent the embroidery, bead, or sequin detailing can be on a ’20s dress. So I decided to stick with something simple that I didn’t have to do much cutting for and could easily jazz up with a few trims and embellishments. I found a vaguely Persian-patterned shawl at TJ Maxx, and loved the colors. And it already had some sequins applied to accent parts of the pattern. Pink sequins! So fun! I just needed a slip to go underneath, as the shawl was of a fairly loose, gauzey weave. I thought gold would go well underneath the shawl’s primarily navy and golden-olive palette, and found a butterscotch-gold poly crepe-back satin fabric to use. 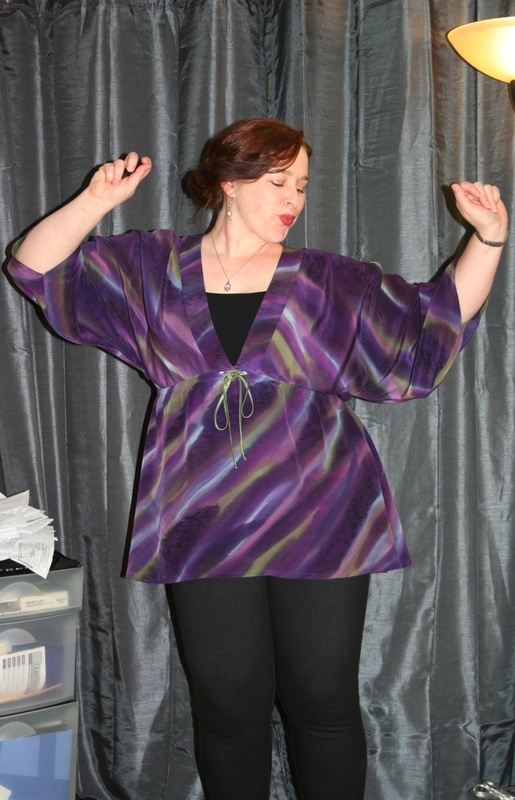 I only used a pattern for the underslip. 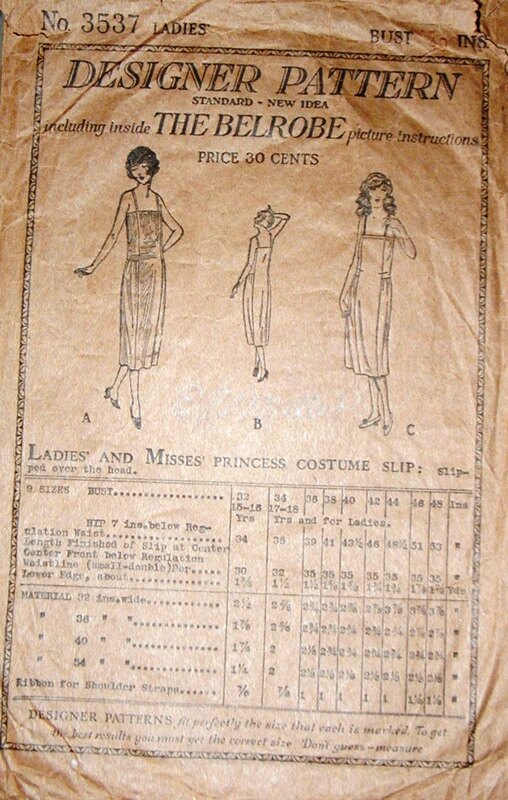 A while back I inherited a few original 1920s sewing patterns from my grandmother and held onto them, thinking I might use one at some point. One of the patterns was for a pieced princess slip or slipdress, by Designer Pattern. And since my grandmother was not a small woman even when she was young, the pattern was actually close to my size! I didn’t bother copying the pattern pieces, just used a dry iron to smooth out the wrinkles and laid them atop the fabric for the slip. No pins. To make the outer dress, I simply folded the shawl in half length-wise and draped it over my dress form, cutting a hole in the fold for the neck. Then I snipped four Vs: one for the front neckline, a lower back neckline, and along the side edges to form the underarm lines. I stay-stitched all the raw edges before the gauzey weave had a chance to unravel, stitched down the sides of the shawl to form sideseams, leaving the bottom few inches open as hem slits. Then I stitched on the organza shoulder straps and handstitched the new pink sequins in place around the neckline and arm openings. I left the bottom hem raw, as the original shawl ends in a fine, short fringe. But the accents and accessories are frequently what makes ’20s evening dresses so appealing—fun, flirty, glittering, and sophisticated. 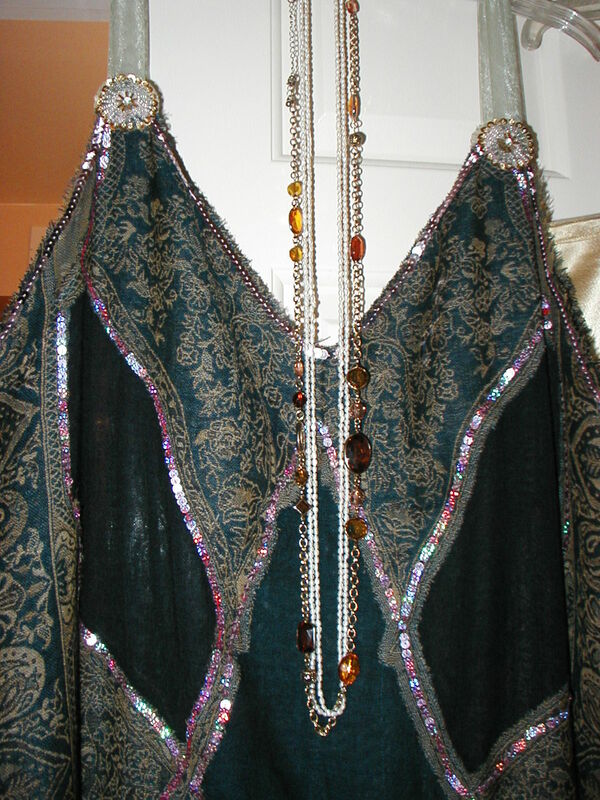 To my supplies I added four iron-on beaded/sequined medallions to accent the shoulder straps where they would join the body of the dress. More pink sequins to outline the neckline and arm openings, sage green organza ribbon to use as straps, a pink and gold organza flower pin, and a narrow, gold net beaded-and-fringed scarf to use as a low sash. Iridescent pink sequins already embellished the design of the purchased shawl; I added regular pink sequins in nearly the same color at the neckline and arm openings. A double thickness of organza ribbon forms the straps, and the ends are covered with iron-on beaded medallions. After ironing on the bead/sequin medallions to cover the raw organza ribbon edges at the shoulder/bodice join, I tried on the outer dress. A few tweaks later and it was ready for finishing. I marked the placement for the gold net/bead sash, tacked it into place, and then crossed the ends on the left side of the dress, slightly towards the front. Last step: pin the flower into place where the sash ends cross. 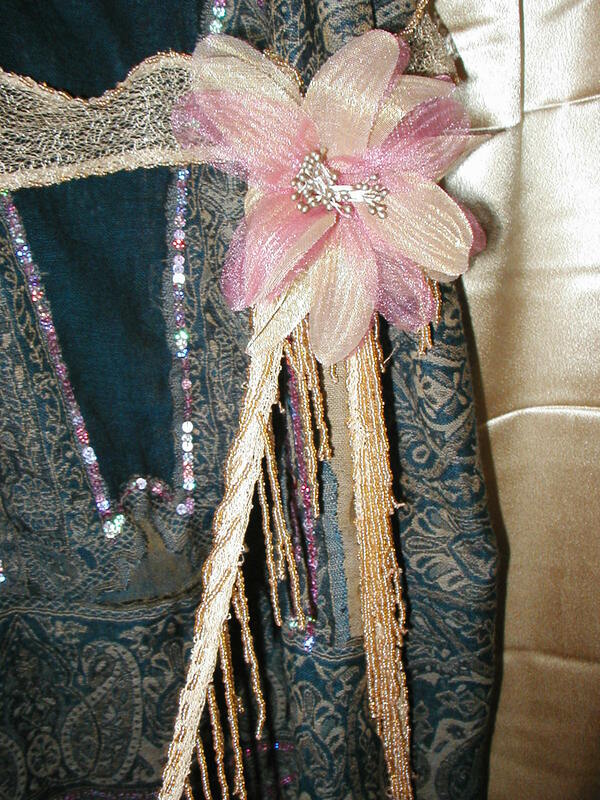 The gold net beaded/fringed sash and pink-and-gold net flower pin. It’s certainly a unique and crafty ’20s evening dress, but the effect was fantastic, especially with the bright butterscotch gleaming through the gauzey shawl material. I’m quite proud of it. It took me most of a weekend to complete. It wore very nicely, although some of the beads on the sash fringe fell off. I was able to dance the Charleston quite easily! I would love to make a few more authentic ’20s dresses at some point from some period dress-draping books in my Amazon wishlist, but I’ll be keeping this one. Dancing away to something resembling the Charleston! 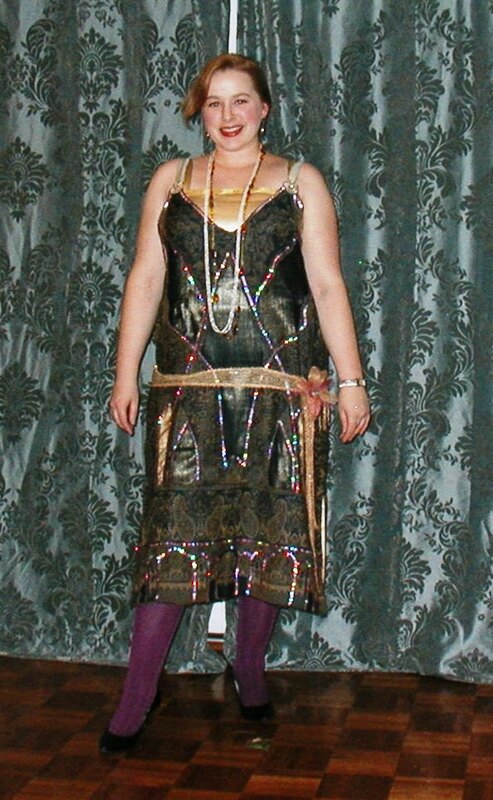 This entry was posted in costuming, Fancy Dress, Uncategorized and tagged 20s dress, flapper, no pattern. Bookmark the permalink.